Meanwhile, as this triple system of White Man civilization developed in India and in the lands about the meeting-places of Asia, Africa, and Europe, another and quite distinct civilization was developing and spreading out from the then fertile but now dry and desolate valley of the Tarim and from the slopes of the Kuen-lun mountains in two directions down the course of the Hwang-ho, and later into the valley of the Yangtse-kiang. We know practically nothing as yet of the archaeology of China, we do not know anything of the Stone Age in that part of the world, and at present our ideas of this early civilization are derived from the still very imperfectly explored Chinese literature. It has evidently been from the first and throughout a Mongolian civilization. Until after the time of Alexander the Great there are few traces of any Aryan or Semitic, much less of Hamitic influence. All such influences were still in another world, separated by mountains, deserts, and wild nomadic tribes until that time. The Chinese seem to have made their civilization spontaneously and unassisted. Some recent writers suppose indeed a connection with ancient Sumeria. 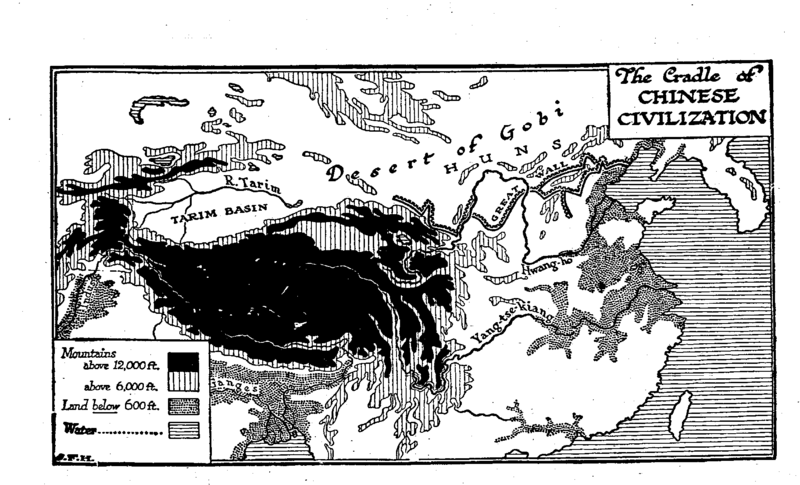 Of course both China and Sumeria arose on the basis of the almost world-wide early Neolithic culture, but the Tarim valley and the lower Euphrates are separated by such vast obstacles of mountain and desert as to forbid the idea of any migration or interchange of people who had once settled down. Perhaps the movement from the north met another movement of culture coming from the south. Though the civilization of China is wholly Mongolian (as we have defined Mongolian), it does not follow that the northern roots are the only ones from which it grew. If it grew first in the Tarim valley, then unlike all other civilizations (including the Mexican and Peruvian) it did not grow out of the heliolithic culture. We Europeans know very little as yet of the ethnology and pre-history of southern China. There the Chinese mingle, with such kindred peoples as the Siamese and Burmese, and seem to bridge over towards the darker Dravidian peoples and towards the Malays. It is quite clear from the Chinese records that there were southern as well as northern beginnings of a civilization, and that the Chinese civilization that comes into history 2,000 years B.C. is the result of a long process of conflicts, minglings and interchanges between a southern and a northern culture of which the southern may have been the earlier and more highly developed. The southern Chinese perhaps played the role towards the northern Chinese that the Hamites or Sumerians played to the Aryan and Semitic peoples in the west; or that the settled Dravidians played towards the Aryans in India. They may have been the first agriculturists and the first temple builders. But so little is known as yet of this attractive chapter in pre-history that we cannot dwell upon it further here. The chief foreigners mentioned in the early annals of China were a Ural- Altaic people on the north-east frontier, the Huns, against whom certain of the earlier emperors made war. Chinese history is still very little known to European students, and our accounts of the early records are particularly unsatisfactory. About 2,700 to 2,400 B.C. reigned five emperors, who seem to have been almost incredibly exemplary beings. There follows upon these first five emperors a series of dynasties, of which the accounts become more and more exact and convincing as they become more recent. China has to tell a long history of border warfare and of graver struggles between the settled and nomad peoples. To begin with, China, like Sumer and like Egypt, was a land of city-states. The government was at first a government of numerous kings; they became loosely feudal under an emperor, as the Egyptians did; and then later, as with the Egyptians, came a centralizing empire. Shang (1,750 to 1,125 B.C.) and Chow (1,125 to 250 B.C.) are named as being the two great dynasties of the feudal period. Bronze vessels of these earlier dynasties, beautiful, splendid, and with a distinctive style of their own, still exist, and there can be no doubt of the existence of a high state of culture even before the days of Shang. It is perhaps a sense of symmetry that made the later historians of Egypt and China talk of the earlier phases of their national history as being under dynasties comparable to the dynasties of the later empires, and of such early “Emperors” as Menes (in Egypt) or the First Five Emperors (in China). The early dynasties exercised far less centralized powers than the later ones. Such unity as China possessed under the Shang Dynasty was a religious rather than an effective political union. The “Son of Heaven” offered sacrifices for all the Chinese. There was a common script, a common civilization, and a common enemy in the Huns of the north-western borders. The last of the Shang Dynasty was a cruel and foolish monarch who burnt himself alive (1,125 B.C.) in his palace after a decisive defeat by Wu Wang, the founder of the Chow Dynasty. Wu Wang seems to have been helped by allies from among the south-western tribes as well as by a popular revolt. For a time China remained loosely united under the Chow emperors, as loosely united as was Christendom under the popes in the Middle Ages; the Chow emperors had become the traditional high priests of the land in the place of the Shang Dynasty and claimed a sort of overlordship in Chinese affairs, but gradually the loose ties of usage and sentiment that held the empire together lost their hold upon men’s minds. Hunnish peoples to the north and west took on the Chinese civilization without acquiring a sense of its unity. Feudal princes began to regard themselves as independent. Mr. Liang-Chi-Chao, one of the Chinese representatives at the Paris Conference of 1919, states that between the eighth and fourth centuries B.C. “there were in the Hwang-ho and Yang-tse valleys no less than five or six thousand small states with about a dozen powerful states dominating over them”. The land was subjected to perpetual warfare (“Age of Confusion”). In the sixth century B.C. the great powers in conflict were Ts’i and Ts’in, which were northern Hwang-ho states, and Ch’u, which was a vigorous, aggressive power in the Yang-tse valley. A confederation against Ch’u laid the foundation for a league that kept the peace for a hundred years; the league subdued and incorporated Ch’u and made a general treaty of disarmament. It became the foundation of a new pacific empire. The knowledge of iron entered China at some unknown date, but iron weapons began to be commonly used only about 500 B.C., that is to say two or three hundred years or more after this had become customary in Assyria, Egypt, and Europe. Iron was probably introduced from the north into China by the Huns. The last rulers of the Chow Dynasty were ousted by the kings of Ts’in, the latter seized upon the sacred sacrificial bronze tripods, and so were able to take over the imperial duty of offering sacrifices to Heaven. In this manner was the Ts’in Dynasty established. It ruled with far more vigour and effect than any previous family. The reign of Shi Hwang-ti (meaning “first universal emperor”) of this dynasty is usually taken to mark the end of feudal and divided China. He seems to have played the unifying role in the east that Alexander the Great might have played in the west, but he lived longer, and the unity he made (or restored) was comparatively permanent, while the empire of Alexander the Great fell to pieces, as we shall tell at his death. Shi Hwang-ti, among other feats in the direction of common effort, organized the building of the Great Wall of China against the Huns. A civil war followed close upon his reign, and ended in the establishment of the Hun Dynasty. Under this Hun Dynasty the empire grew greatly beyond its original two river valleys, the Huns were effectively restrained, and the Chinese penetrated westward until they began to learn at last, of civilized races and civilizations other than their own. By 100 B.C. the Chinese had heard of India, their power had spread across Tibet and into Western Turkestan, and they were trading by camel caravans with Persia and the western world. So much for the present must suffice for our account of China. We shall return to the distinctive characters of its civilization later.